Hip replacement surgery, also called total hip arthroplasty, involves removing a diseased hip joint and replacing it with an artificial joint, called a prosthesis. 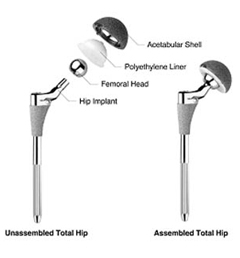 Hip prostheses consist of a ball component, made of metal or ceramic, and a socket, which has an insert or liner made of plastic, ceramic or metal. The implants used in hip replacement are biocompatible - meaning they're designed to be accepted by your body - and they're made to resist corrosion, degradation and wear. 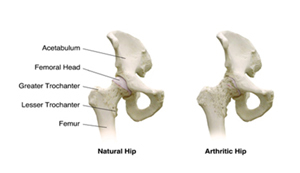 Hip replacement is typically used for people with hip joint damage from arthritis or an injury. Followed by rehabilitation, hip replacement can relieve pain and restore range of motion and function of your hip joint. In total hip replacement surgery, the ball and socket that have been damaged by arthritis are removed and replaced with artificial parts made of metal and a durable plastic material. We call these artificial parts "implants," or "prostheses." 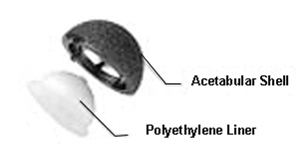 There are two main types of fixation philosophies-cemented and porous. Both can be effective in the replacement of hip joints.` The physician (and the patient) will choose the best solution that is specific to the patient's needs. 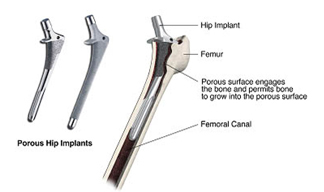 The porous hip implant is designed to be inserted into he prepared femoral canal without the use of bone cement. 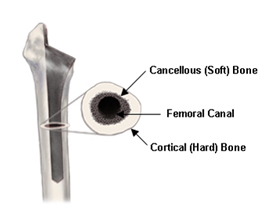 Initially, the femoral canal is prepared so that the implant fits tightly within it. The porous surfaces on the hip implant are designed to engage the bone within the canal and permit bone to grow into the porous surface. Eventually, this bone ingrowth can provide additional fixation to hold the implant in the desired position. What to Bring to the Hospital ? Below is a list of things you may want to bring with you to the hospital in preparation for your surgery. Talk with your physician, as he/she may have additional information about preparing for your hospital stay. The patient is first taken into the operating room and given anesthesia. After the anesthesia has taken effect, the skin around the upper thigh is thoroughly scrubbed with an antiseptic liquid. An incision of appropriate size is then made over the hip joint. The shell portion of the socket implant may be attached either by using a special kind of epoxy cement for bones, or by pressing the implant into the socket so that it fits very tightly and is held in place by friction. Some implants may have special surfaces with pores that allow bone to grow into them to help hold the implant in place. Depending on the condition of the patient's bone, the surgeon may also decide to use screws to help hold the implant in place. 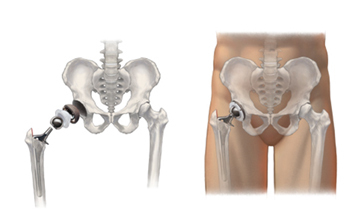 This page provides a brief introduction to hip replacement. It can help you make a list of questions to ask your doctor, but it is not meant to provide complete information. Check with your surgeon's office about more comprehensive resources and patient education materials. Since hip pain results from damage to the joint, there is no "cure." However there are a variety of treatment options available, ranging from rehabilitation to total hip replacement surgery. If you have difficulty walking or performing everyday activities such as getting dressed, it may be time to consider hip replacement surgery. Doctors generally try to delay total hip replacement for as long as possible in favor of less invasive treatments. However in patients with advanced joint disease, hip replacement offers the chance for relief from pain and a return to normal activities. You should also finish any dental work that may be underway to prevent germs in your mouth from entering the bloodstream and infecting the joint. It is likely that you will need blood during hip surgery, and your surgeon may place an order with the blood bank in case a transfusion is needed. If you prefer, or if your surgeon feels it is needed, you may want to donate your own blood ahead of time to reduce the risk of your body reacting to the blood transfusion. Read the Surgery Calendar for more information on how to prepare for surgery. The surgery usually takes two to four hours, although this is dependent upon the severity of the arthritis in your hip. In the operating room, a urinary catheter will be inserted and left in place for one or two days. Compression stockings and pneumatic sleeves will be put on both legs. The procedure is performed through an incision over the side of the hip. 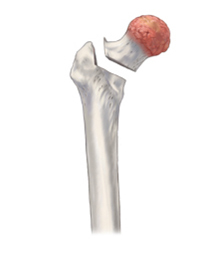 The ball-end of the thighbone (femur) is cut and replaced with the new metal ball and stem component. It may be stabilized with or without cement. The damaged surface of the socket is smoothed in preparation for the insertion of the new socket. The ball and socket are then joined. When the surgeon is satisfied with the fit and function, the incision will be cleaned and covered with dressings. You will also find small drainage tubes coming out of the hip to drain fluid from the wound. How long does the surgery take? What is the recovery time? In the weeks immediately following surgery, you may need walking aids such as a cane or crutches. Within a few months, however, you should be able to return to normal activities. For more information, please read, Your Hip Surgery and After Hip Surgery. Bone Cement : - A special type of bone acrylic cement may be used to secure some or all of the implant components to the bone. If used, the bone cement takes about 15 minute to set. 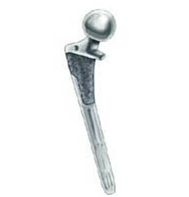 Press-Fit : - In other cases, the implants may be "press-fit" into the bone. Press-fit components may have a special porous coating that allows tissue to grow up to it for fixation. Combination : - In some cases, your surgeon may choose a combination of cement and press-fit attachment, depending upon the implant components and condition of the pelvic and thigh bone. The decision as to whether to use a cemented or press-fit component depends upon many factors, including the manufacturer's intended use of the product, surgeon philosophy and the patient's condition. After about two to four days, or when your surgeon determines that you have recovered sufficiently, you will be discharged. You may be transferred to a rehabilitation facility for a few more days, as determined by your surgeon. Upon returning to your home, you will need to continue taking your regular medications and continue exercising as directed by your surgeon or physical therapist. Walking, remaining active and practicing the required exercise are the quickest ways to full recovery. Read the Surgery Calendar to learn more on what to expect after surgery. Longevity of the prosthetic hip varies from patient to patient. It depends on many factors, such as a patient's physical condition, activity level, and weight, as well as the accuracy of implant placement during surgery. It is useful to keep in mind that prosthetic joints are not as strong or durable as a natural, healthy joint, and there is no guarantee that a prosthetic joint will last the rest of a patient's life. 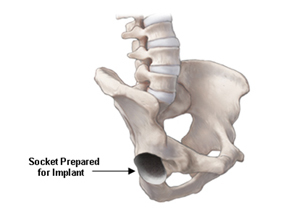 Today, total hip replacement has become a common and predictable procedure. Many patients enjoy relief from pain and improved function, compared to their status before surgery. As a result, some patients may have unrealistic expectations about what the prosthetic hip can do and how much activity it can withstand. As with any mechanical joint, the ball and socket components move against each other. Natural fluid in the joint space, called synovial fluid, helps to lubricate the implants just as it lubricates the bones and cartilage in a natural joint. Still, the prosthetic components do wear as they roll and slide against each other during movement. As with car tires or brake pads, the rate of wear depends partly on how the hip joint is used. Activities that place a lot of stress on the joint implants, as may be the case with heavier and more active patients, may reduce the service life of the prosthesis. Implant loosening and wear on the plastic portions of the implant can lead to the necessity for revision surgery to replace the worn components, or all of the components. Your doctor will be in the best position to discuss these issues with you, taking into account your particular clinical circumstances, the type of implants used, and your post-surgical lifestyle. 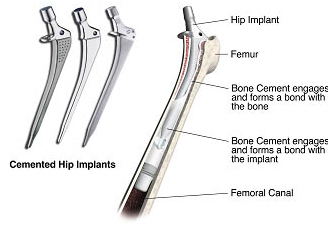 Some common complications specific to hip replacement surgery include loosening or dislocation of the implant and a slight difference in leg length. Your healthcare team will discuss these possible complications with you and the precautions taken against them. In the U.S., the average joint replacement patient is around 65-70 years old, however patients of all ages have received hip implants. What activities can I do or not do after receiving a hip implant? Typically, patients are advised to avoid high impact sports such as jogging, basketball, racquetball, gymnastics, etc. Safer activities may include walking, golf, swimming, and bicycling. Your doctor will advise you on safe activities for your particular condition. Patients have reported mixed experiences at airports: some detectors go off and some don't. You may be provided with a special card to keep in your wallet explaining that you have a hip implant. Doctors generally allow patients to resume sexual activities as soon as they feel able. In the months following surgery, patients are generally advised to take it easy and modify their positioning to keep pressure off of the joint while it's healing. As always, it is best to consult with your doctor about what's safe for your particular condition. Will a hip implant last a lifetime? The longevity of a prosthetic hip (how long it will last) varies from patient to patient. It depends on many factors, such as a patient's physical condition and activity level, body weight and the surgical technique. A prosthetic joint is not as strong or durable as a natural, healthy joint, and there is no guarantee that a prosthetic joint will last the rest of a patient's life. All prosthetic hips may need to be revised (replaced) at some point.